Located in present day Lanier County, GA, the old Union Church lies about 10 miles east of where Levi J. Knight settled on Beaver Dam Creek (now Ray City, GA). It was the first church to serve the pioneer settlers of this region. L. J. Knight’s parents, Sarah and William Anderson Knight , were among the organizing members of the church. Built on land provided by Jesse Carter, the church was originally referred to as Carter’s Meeting House, and later designated Union Church. The church and cemetery were on a trail used by the Creek Indians traveling between the Chattahoochee River and the Okefenokee Swamp. During the Indian Wars, 1836-1838, the church building was partially burned. The fire-damaged timbers were used in the reconstruction, and since that time Union Church has also been known as Burnt Church. Union Primitive Baptist Church, the mother of all the churches of this faith in this immediate section of Georgia, was organized or constituted October 1st, 1825. The presbytery consisted of Elders Fleming Bates and Mathew Albritton. As is well known, the church is located on the banks of the Alapaha River about 1 1/2 miles south of Lakeland formerly old Milltown. It stands to-day where it has always stood for the past 108 years (1933). The cemetery close by contains the graves of many pioneers and old citizens of east Lowndes, southeast Berrien and western Clinch counties. Baptisms have always taken place in the nearby river, it not being over one hundred yards from the church to the river. A high bluff with a sharp bend in the river’s course is the visitor’s introduction after he has passed the church. Several steady-flowing springs of fine drinking water are to be found on the banks, and eminating from the walls of the bluff. Part of the bluff slopes off to the river’s edge at the river bend thus making an ideal place for baptism purposes. 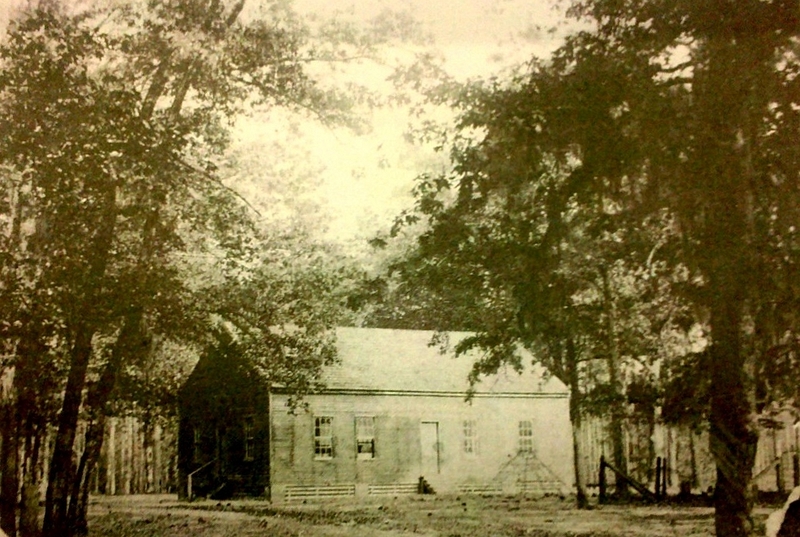 The little log-house which was the first building on the site of the present church, had come to be known as Carter’s Meeting House prior to the organization of the church. For some months prior it had been the scene of monthly meetings or services, and it was the expression of the desire of the settlers to have some kind of divine services in their midst, for there was not a church to be found of any denomination from the Altamaha River to the Florida and Alabama lines. The settlers in this immediate vicinity were more numerous than in most of the settlements, and many of them Carters. The meeting-house took its name from old man Jesse Carter and he probably gave the land and his boys had a hand in building the original log house to hold services in. The earliest settlers had only been living here four years at the time, while the most of them had not living here hardly a year. Knights, Carters, Giddens and Lees made up most of the settlers west of the river while on the east side of the river were to be found Tomlinsons, Sirmans and Fenders, Corbitts and Mathises. Further down the river could be found the Wetheringtons, Swilleys, Peters, Walkers, and Roberts. Elder William A. Knight, at that time a layman, was one of the leading spirits in the formation of the church. As already stated it was Elders Bates and Albritton who presided at the organization of the church, but to “Old Father Knight” as many people called him in his lifetime, may be attribute more than anyone else the religious activities of the community in those days when the first settlers were moving in. He led in prayer and in song, and when the preacher failed to keep an appointment because of lurking Indians, high waters or other providential hindrances it was Bro. Knight who took charge and carried on the service. Five years after the church was organized he was licensed to preach the Gospel and two years later (1832) he was ordained to the full Gospel ministry. On August 24, 1827, a council met in Thomas County, Georgia to determine the feasibility of forming a new association in the region. The council arranged for another meeting at Mt. Gilead Church in September and requested that all interested churches send messengers with a statement of faith and the date of their constitution together with names of the ministers taking part in it. The careful attention to detail was necessary, because many churches in the area had cut corners in their organization. An example is Shiloh Church in Ware County. In 1833, the Ochlocknee Association would not accept Shiloh Church because it was constituted “illegally.” However, the association did offer instruction on how to craft a new constitution, which Shiloh did. The council decided to go ahead with the plans for a new association. In October, 1827, the Piedmont Association, “received and read a petition from seven Baptist churches situated between the Alapaha and Flint River praying ministerial aid to constitute them into a new association.” The Piedmont set Matthew Albritton and Fleming Bates to oversee the organization of the Association. Both were members of Union Church, near present day Lakeland, Georgia, which requested and received dismission from the Piedmont to join the new association. The new association grew quickly. By 1833, the Ochlocknee had thirty-­five churches with 1,010 members. Though migration to the region was steadily increasing during this time, it did not account for all of the increase. In 1833, 179 were baptized into the association’s churches. Fourteen new churches applied for membership during the same year. So many neophytes comprised the new churches that the association appointed William Knight to instruct them on the proper duties of churches to the association. The rapid expansion expanded the Ochlocknee’s borders to extend from the Piedmont Association to the St. John’s Association. The expansive size of the association prompted a proposal to divide at the 1833 meeting. In 1834, Friendship, Union, and Elizabeth churches in Georgia, and Providence, New Zion, Concord, Newington, and New River in Florida, were dismissed from the Ochlocknee Association to form a new association. In a reflection of the intense territorialism of the associations of the period, the new body was given a boundary that extended up the Suwannee, Withlacoochee, and Little River. The association took the name Suwannee River and scheduled a constitutional meeting at Concord Church for December, 1834. The delegates duly arrived at the meeting, but the ministers failed to show. At a rescheduled meeting held in September, 1835, only one appointed minister showed, so the delegates co­opted William A. Knight as the other member of the presbytery and proceeded to formally organize the association. By the beginning of the 1840s, tensions in the region had eased and the Suwannee was experiencing growth. The 1840 minutes of the Suwannee Association speak of a revival that was strongest among its congregations in Georgia. However, this period of growth and expansion would eventually produce discord and division among the Baptists of South Georgia. In 1856 the Union Association was constituted with twelve churches formerly belonging to the Suwannee Association, most of whose churches were in Florida. A division was agreed to, making the State line the dividing line between the two Associations. The constituting presbytery was composed of Elders J. E. W. Smith, William A. Knight and J. B. Smith met at Union Church. Her ministers were Elders William A. Knight, Moses Westberry, Ansel Parrish, J. D. Hutto and E. J. Williams, with perhaps two licentiates. Harmony prevailed for a number of years, and the progress of the Association was upward and onward. If the writer could properly write the life of these earnest consecrated servants of the Lord, it would be equal to writing an account of the religious life of this section in the Primitive Baptist denomination. Fearless in fighting sin and bold in preaching Christ and faithful in contending for the Faith, they have served nobly and well and unborn generations will bear witness to the fruits of their work. With few exceptions the writer has not sufficient biographical data at hand now to write of their individual lives, but we know of their godly records. We hope to write later of the lives of these great preachers. The clerks of the church likewise contain a list of fine men, known throughout their communities and counties for their good, upright lives, and their staunch Christian characters. We do not know who the first clerk was. Bro. Edmund Mathis, one of the deacons, having removed his membership, Bro. Joshua Lee was elected in his place March 10, 1833, and ordained April 13, 1833 by Elders Peacock, Friar and Knight. September 6, 1839, Bro. Edmund Mathis was received back into the membership by letter from Concord church, Hamilton County, Fla., and acted as a deacon until dismissed again by letter April 10, 1841. On June 13, 1841, brethren Jacob Hughes and John Lee were ordained deacons. Members of the presbytery not shown by minutes. March 13, 1852, brethren Richard H. Burkhalter and J. D. Peters were elected deacons. They were ordained June 12, 1852 but the minutes do not show who constituted the presbytery. Bro. Burkhalter died in 1862 and Bro. Peters also died a member but we do not know when. The minutes do not show any further ordination of deacons until 1891 when Bro. John P. Tomlinson was elected on May 9th. On June 13, 1891 he was ordained by Elders J. A. O’steen and T. W. Stallings. On December 9, 1899, Bro. James L. Robinson was elected a deacon but was never ordained. On November 10, 1906 Bro. Israel G. Carter was elected a deacon and ordained January 12, 1907 by Elders B.P. Lovett from Salem Church, I. A. Wetherington from Unity church, A. A. Knight , the pastor. On October 9, 1909, Bro. J. A. Weaver was elected deacon, and ordained February 12, 1910 by Elders Wetherington, Chitty and A. A. Knight . The minutes do not disclose that the church ever had any treasurer until 1909 whem on October 9th, Bro. J. A. Weaver was elected as such. 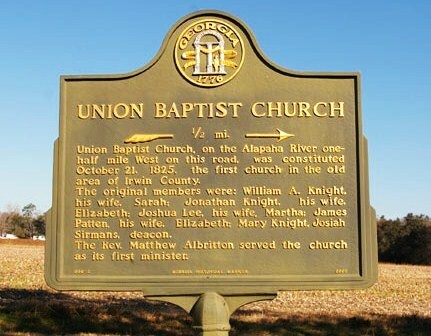 Historic Marker – Union Church, organized 1825. Sarah and William A. Knight were founding members.